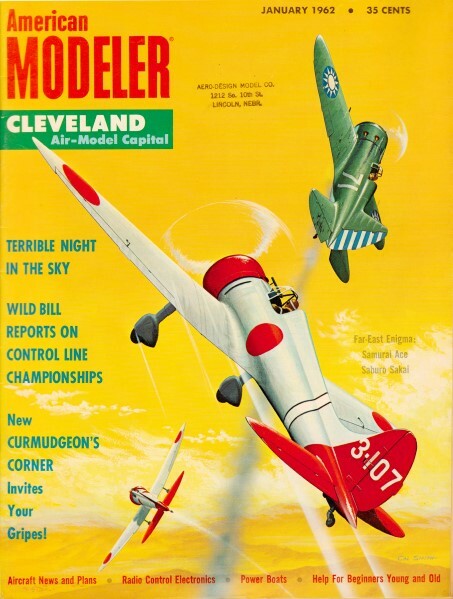 Aquitivity Roundup was a monthly column in American Modeler (the precursor to American Aircraft Modeler, precursor to the current Model Aviation). American Modeler covered many aspects of modeling other than airplanes (helicopters were for experimenters) including rockets, boats, cars, and to a lesser extent, trains. 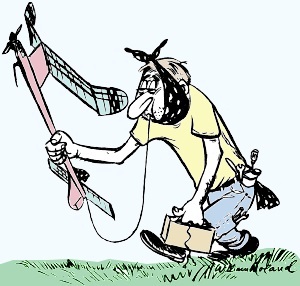 Radio control for models boats was in full swing by 1962, both for powered and sail boats. You may be interested in model boating and like to read what is going on. Remember this-so does the other fellow. We don't "manufacture" news of boating activities. You and other active hobbyists must supply it and must do so continually. All known active clubs have been contacted and these facts made clear to them. There is more activity in boats than ever before ... 1961 has been the biggest and most successful year our hobby has experienced. With each succeeding contest the number of entries increased. What you are doing is of interest to others so let us know what you and your group are doing. Also, if you have solved a problem and want to pass the solution on send in your findings. If you have a problem and no solution, let us know that. If you have pictures of interesting craft or a new installation idea, shoot 'em in! To augment the news angle of the column, we plan to include interesting facts about boats ... why they are built as they are and what makes them operate successfully. Design features of famous boats, racing and otherwise, discussions about hydro-foils and such will be for the builder who wants to try something different. 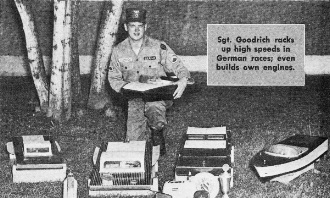 Lead photo (above) shows Sgt. 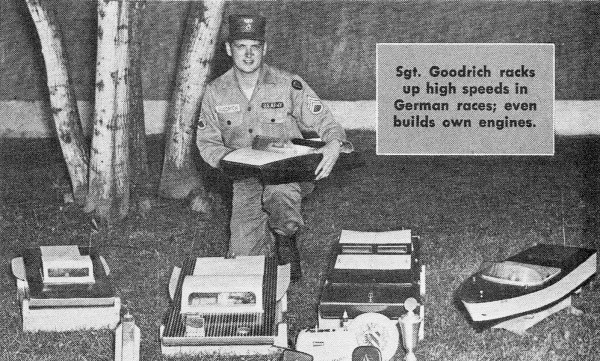 Roland W. Goodrich of Minneapolis, stationed in Augsburg, and his fine collection of boats and hardware. In Germany for the past four years, Roland started boat modeling there; competing in local contests he's done very well. Says American Modeler is very popular, has to purchase two copies each month to keep one in reference condition. R.G., your speeds over there with Fox .59 power are very good and comparable with the top boats here. 27 mph on straight runs and 21 mph around a three-buoy course is about as fast as any .60 or .61 boat to our knowledge. Your electric speed record of some 18 mph on a straight run hasn't been topped in the U.S. Any dispute to this statement? To back up what we stated re 1961, Rich's Hobbytowne says "This has been the most successful record-breaking season so far." At a New York Boat Club meet there top tether speed was 103.69 mph. First place results: Class A, M. Biederman, 139.56 points; Class B, M. Biederman, 146.04; Class C, J. Howarth, 182.29; Class DM, E. Kalfus, 170.97; Class DS, F. Shor, 169.85. The M and the S following the class designation means "modified" or "stock" engines. Annual International Regatta held by IMPBA at Lombard, Illinois, saw established thirteen new World's Records in R/C and two in Tether. There were 80 entries and more R/C events than in any contest thus far. Top man Gary Preusse scored a first in Precision Steering, Electric Speed and Gas Speed (over .30 C.I.D.) as well as a second in Gas Speed (under .30 C.I.D.) and a third in the Straight Sixteenth (over 30 C.I.D.) speed event. In a Precision Steering event for women, Marianne Pitts out-did many of the men with a perfect 120 points. New York Mirror reports that 100 young skippers participated in its 5th Annual Junior Championship Model Yacht Regatta before 1000 spectators. When the results were in, Melissa Jahn, 14, of Mineola, L.I., had won two first place trophies, taking Class E title event and Class II model boat competition, as well as second place trophy in Class D championship race. Any of you rag boys done as well lately?